Personal Branding, Are You An Advocate? 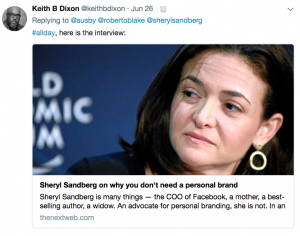 In Brian Clark’s article on TheNextWeb.com, he reports that Sheryl Sandberg does not think she has a brand, and that she believes she is only using her voice. I beg to differ. I believe that the fact that she is a household name, whether she likes it or not, means she has a brand. And here’s why: Personal branding is about reputation. Your personal brand is a way for us to determine whether or not you are someone we can trust. Your customers define your brand. A brand is something bestowed on a product, idea or person by the audience bestowing it. Just like beauty is in the eye of the beholder, so brand recall, brand loyalty and brand trust comes from the customers of the brand. Nike isn’t Nike because of the marketing it does or how it is packaged. It is a brand because over time it has become something people understand to have a specific meaning and with that meaning comes a level of trust. Building a brand comes from providing something that the audience can feel, align with and rally around. The fact that Nike is much more famous than Inov-8 doesn’t mean that Inov-8 is not a brand. All other things being equal, Nike has just been around for longer and has earned more money to promote itself (aka brand) with, but customers still give the brand it’s voice. You are who you are in the listening. You are no-one if all you do is sit in your living room never communicating with anyone. Do you want to be known or unknown? Do you want to be famous or infamous? When you start talking to people, sharing yourself via social channels, traditional media outlets, writing books, speaking publicly, you are building a reputation and a brand around who you are so that people can figure out if you are the right person for them to hire, friend, partner with, marry, look up to, date, and refer to others. Whenever you are in the media whether it is social or traditional, you are building your personal brand. We buy or don’t buy from Patagonia because we believe in the quality of the product and the ideals and philosophies upon which the company stands. We support the company and give money in exchange for goods because we believe we are getting something we want from a brand we trust. And just as brands are built by customers, voices are built by listeners. If no-one is listening, you have no voice. If everyone is listening, you have a voice and you become a spokesperson for whatever venture you are currently on whether it is Facebook, feminism or your own personal story. Building a personal brand may not be something that Sheryl feels she is doing, but it’s something she has been doing all her life. By telling her story in Lean In, by sharing the loss of her husband so openly on Facebook, she opened her heart to the public and let us know more about her. That is trust building. That’s what she means when she talks about being authentic and sharing her voice. She absolutely has a voice and moreover, she has a brand. She just doesn’t know it, because she doesn’t feel like she has put in any effort, i.e. money to build it, but oh she so has. The more famous you become, the bigger your voice is. That’s because people recognize you as a brand. We consumers form ideas about who you are, when we hear or read your name. 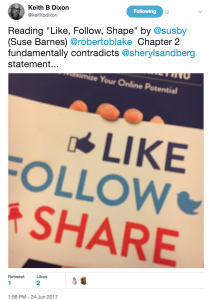 We listen to Sheryl Sandberg because she has built our trust through the number of people she has been able to acquire as followers and fans. Unfortunately those who have the biggest voices are also those who have the biggest reputations. And just like product brands who we associate thoughts with before hearing any more than their brand name, so personal brands have the same effect. So, whether you read Sheryl Sandberg, Mark Zuckerberg, Steve Jobs, Bill Gates, Ben Parr, Sophie-Charlotte Moatti, Neil Patel, Danny Sullivan, Rand Fishkin, Avinash Kaushik, Seth Godin or your own name here, [insert name here], each of us known by our history, what we have contributed, said, posted, experienced and accomplished. Your personal branding is about how many people have seen or heard about those accomplishments and experiences. Today more than ever, in a world of countless opportunities to have a voice, and how you shape your personal brand matters. Your reputation precedes you. You are a brand. In his book Youtility: Why Smart Marketing is about Help Not Hype, Jay Baer extolls the value of smart marketing by providing self-serve information, radical transparency and real-time relevancy. I love this philosophy and look for it in my own interactions with businesses. 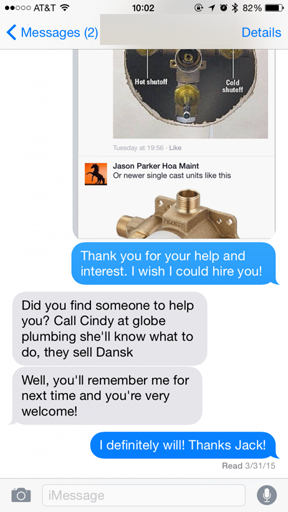 Here are three recent experiences about the power of help for marketing your business. I had a leaking shower-tub faucet, so I searched for a “plumber near 94612” and found “Women’s Plumbing Repair” on Yelp. The reviews looked excellent so I called. Instead of getting a receptionist though, I got an answering machine message saying, “Please do not leave a message here as I have hundreds of messages that I’m unable to check. If you need help, please call or text my cellphone number at …” I was surprised by this message, but also impressed, because if they had so many messages on their voicemail. To me, that meant they must be busy and therefore good at what they do. So I called and left a message on the cell number. Jac called me back and left me a message this time. She said to send her a text with the details of when we could meet etc, so I did and we scheduled something. 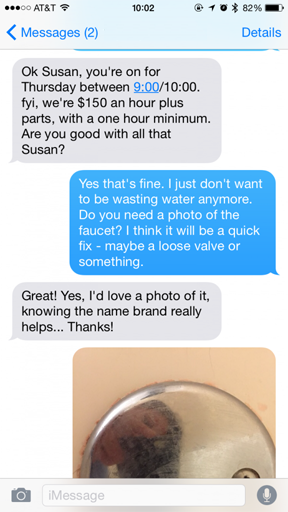 Since I figured she would likely need a part for the faucet, I asked her if she wanted a photo and here’s what ensued. Not only did she tell me how to get the part, but she also referred me to a supplier who could help me source the part, and she told me that I could do the work myself. Wow! She didn’t want to charge me. Yes, my job was small, but I was quite willing to pay to get it done. Instead of her taking every project, Jac is building up goodwill by being super helpful. As the Yelp reviews and her full voicemail box attest, the power of help is definitely working. I got the diverter part from the manufacturer and another one from the supplier and both were free. I did need some help installing it, but I was able to get that from Jason, my handy HOA maintenance person who I’ll talk about next. Oh and one more thing, since this post is about marketing and social media, my neighbor Philip offered to help anyone having a similar problem on Facebook through our private neighborhood group, so all in all it was very much a community project. Philip showed me how to remove the faucet, Jason helped me drill away some of the travertine (marble) to allow for the new diverter to be installed and Jac helped me find the part. I am extremely grateful to all three people here and was particularly impressed by Jac’s helpfulness. I definitely know who to call if I have a bigger plumbing issue or need to refer a plumber to someone. In fact if you’re ever in need of a plumber in the Oakland area, I recommend you call Women’s Plumbing. 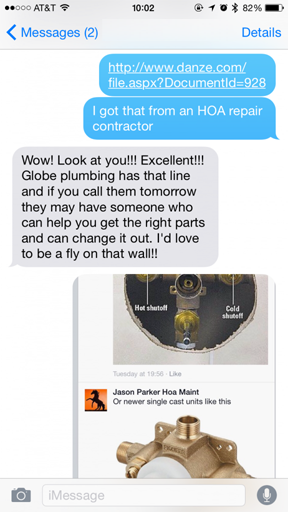 Jason Parker is a handyman who helped our HOA on various small projects in the building. He has built a reputation for being helpful not just by fixing things and helping people install new lights, TV mounts and electrical wiring, but also because of the tips he offers on Facebook from time to time, just for the good of the community. 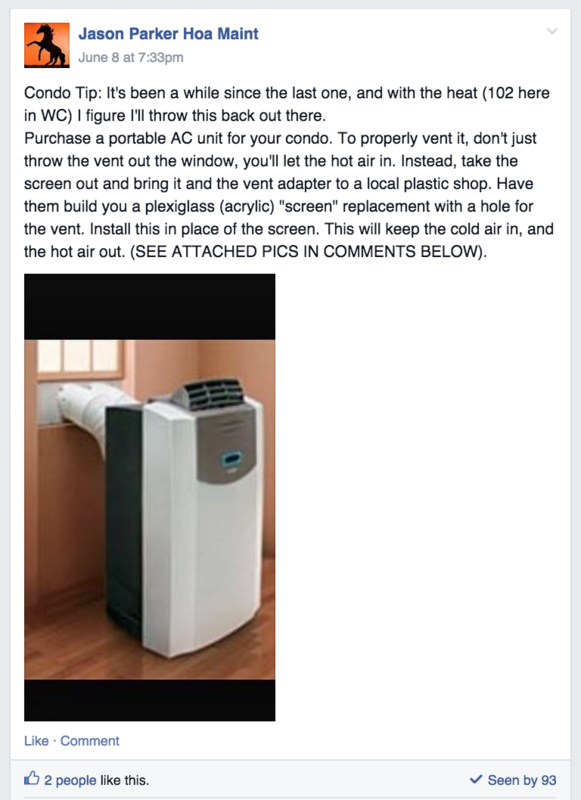 Every few weeks, Jason posts a tip to our private group page which is very helpful. He doesn’t ask if anyone needs help or offer his services. He simply provides useful information out of the blue. This is usually information which someone might need and use at some point, but it is unsolicited and just plain helpful. What this does is keep Jason top of mind for building residents and homeowners. It also makes people feel like they know and understand Jason and that he can be trusted. Then the next time someone needs some done work in the building, who do you think they think of first? That’s right Jason Parker HOA Maintenance man is who. He’s also available via text and phone and is just a really good guy. He has used power of help to build strong relationships with residents of our building and in so doing, we trust him and think of him first for any odd jobs that we need to get done. I recently needed to get my smog check certificate for renewing my registration and took my car to the nearest Smog Test station. To my surprise, the car failed. How horrifying! The tester told me that I could get the car repaired by my mechanic or any smog repair shop and also that I could apply for financial assistance from the State of California to offset some of the expenses. I asked if the failure could be due to the cooler weather or the car being cold and the tester said no. The tester also indicated that the car had failed quite substantially, so I was very concerned. I have a 1998 BMW 323is and have been taking it to Bavarian Professionals for years. (I was referred to them by a friend I trust.) I drove home from the Smog test station and called Bavarian Professionals. I told them that my car had failed the smog test and they said they would be happy to schedule an appointment, but I might want to try driving the car for a bit longer before getting a smog retest. They recommended driving the car for at least 15 minutes on the freeway before getting the car tested again, apparently because the catalytic converter takes a while to warm up. They could easily have taken my car in and charged me for a diagnostic and any repair they felt like doing, but instead they told me the truth about the car and offered a free solution. I said I would try that first before scheduling an appointment, so a couple of weeks later, I did just that. I drove the car on the freeway for about 30 minutes and then took into into the same smog test station as I had been to before. The car passed the test easily and there were no questions asked. What a relief! If I had spoken to a mechanic who was just trying to get money out of me, I probably could have spent a few hundred dollars on needless repair. I am extremely grateful for the honesty of Bavarian Professionals who once again rose to the occasion to earn my trust. Their power of help leads to happy and loyal customers like me. I will always take my car to them for service. While it may be tempting to take any job that comes your way, think about it from a longer view perspective. How many people would have heard about the service provider if each of the above people had just taken the job instead of being helpful? And how many people will hear about them since they were helpful? That’s right, a lot more. Doing the right thing earns trust and trust is crucial to staying in business and earning more work than you can handle. Make sure your car’s engine is nice and warmed up before you get a smog check. Always offer value and treat your customers like you would treat your friends. As Jay Baer says: “Smart marketing is about help, not hype.” Helping earns trust. 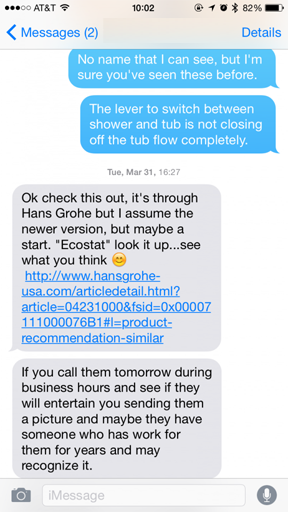 Being helpful can be a powerful marketing tool. Have you had any experiences in which you were particularly wowed by the customer service or “un-marketing” of a business or service professional? What does the power of help mean to you? Please share your experience in the comments below. Thank you! Social media has brought about truly significant changes in the way we produce and receive information. A piece of news that in the past might have been distributed as one unit, in one specific way, can now be posted as four or five separate bits of content. For example, 25 years ago, a company might have written a single press release to announce the launch of a new product. Today you could write a detailed blog post about your new product, or even several posts if you wanted to provide the story of its development, list its technical features, interview the designer, and explain how to use it. Then you could tweet brief announcements about the launch party the day before, and the day of. Post photos of the new product on Instagram, along with a link back to your blog or webpage. Make a behind-the-scenes video before the product’s launch, and afterwards make a video demonstrating how to use it. Post that video on YouTube and on your company’s Facebook page. Make a cool infographic with some details about the item or your company, or even about similar products and post it on Pinterest. Update your company’s LinkedIn profile or add a Spotlight page to provide more information to your professional network, or even post it on LinkedIn from your personal profile since LinkedIn now offers longer posting capabilities. While this might seem like overkill, remember that all of your customers or potential customers will not be following you on every form of social media. Even if they were, people generally only see a fraction of all the content that is posted because of the way their news feeds are structured. For example, an individual person might follow your company on Facebook, Twitter, and Instagram, but they haven’t logged in to Instagram since last July and they have 750 friends on Facebook so your post got lost in the noise. That means that they only actually saw your tweet! Furthermore, you will not be posting exactly the same content on each page – Instagram has a photo, while your blog has an article. The content will be adjusted, customized to reflect the culture of different social media sites. Producing different content is not only a cheap way to extend your marketing; it’s an essential tool for reaching your audience. Remember that people have different learning styles as well as different levels of interest and understanding about your product. While some people would prefer to read, others like videos. For someone who is only tangentially interested in your product, a tweet might be all they need or want to know, but an industry insider will be eager to read all of the in-depth details. You can actually help the public and the media understand your product better by providing materials and information in a variety of formats to meet their needs. Another way to create fresh content is to ‘spin’ popular or detailed topics into multiple posts. Take one key concept or piece of information and write about it from a variety of different perspectives, or as a series. For example, I could take one topic, vegetarian cooking, and write “Vegetarian Cooking for Beginners,” “Top 5 Tips for Vegetarian Meals” “Video: How to Make Vegetarian Lasagna” and “The Vegetarian Revolution”…and so on. This level of detail can be attractive to people who are hunting for quite specific advice. If you are short on time and resources, you will definitely need to make the most of the content you have created. Here are just a few of many repurposing content shortcuts that anyone can use. Start by choosing a solid piece of content, perhaps your “evergreen” content, or just one that got a lot of likes or has really great information. Then, create an outline or list of the main points and share it on social media. Or, find a great one-line quote from the text or an interview and use it to create a word-image to post on Instagram. Alternately, you could tweet a great quote from the article, with a link back to the original post. Combine some statistics or data from a blog post with an image and post it on Facebook, or create an infographic to post on Pinterest. Your turn: What have you found to be most beneficial when sharing content on social networks? Do you share the same content on all networks? 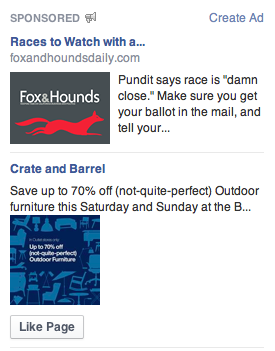 Or do you repurpose or spin the content to best meet the needs of each visitor on each different social platform? If you haven’t read The Long Tail: Why the Future of Business is Selling Less of More by Chris Anderson, read it. The book is much more entertaining that the Wikipedia definition. I was just referred to this blog titled “Social Media Will Change Your Business” from one of my favorite Facebook contacts. She’s not really a friend and I don’t even remember how I am connected to her, but she posts really great quotes on Facebook and I am inspired daily. Thank you @claudiaguzman who I just today discovered that you are on Twitter. I’m really going to enjoy following you on Twitter too. 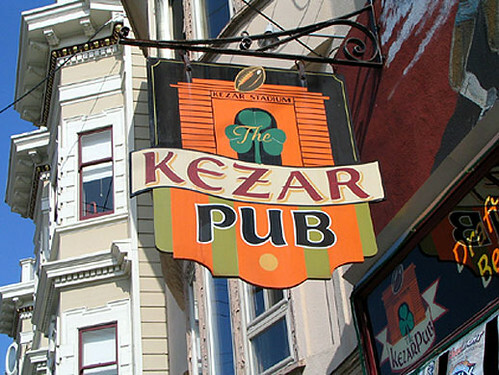 The blog (and introductory video) mentioned above, was last updated in February 2008. Yes, that’s a long time ago, but the story was first published in 2005 and the post is still receiving comments. That’s the power of the long tail. Post something once and it may just live on forever. If it’s on the web, people can find it, link to it, share it and help it spread. This is a great example of that and also the power of crowd sourcing. What’s your favorite Long Tail story? For Best Results in Social Media, Think L.O.V.E. On Sunday, I gave a presentation on Social Media for Market Research in Michaela Hayes‘ Market Research class for the Green MBA Program students at Dominican University of California. In working on the deck, I came up with a new way to remember your what your social media plan should include. And it’s so easy to remember, because it spells the word LOVE. We all love to be loved, to be in love, to give love and to get love and that’s what social media is all about. It’s about LOVE. Listening is one of the best ways to show your love for someone. You can’t have a conversation unless you are listening to the other person, (think your ideal audience) and asking them questions about how they are and what makes them happy. If you haven’t started listening in the social media space, a good place to start is with Google Alerts. Simply enter the name of your product, business, favorite person or project, and alerts will send you emails detailing any mentions of your interest on the web. Twitter’s search allows you to see what peeps are tweeting about in the Twittersphere. Enter a few keyword phrases into search.twitter.com and see who is talking about it in on Twitter. Find the people you want to follow and join the global conversation. Collecta.com is another way to get real time results and listen to the buzz about your product or industry online. And a little out of the box, but still part of listening, is asking questions of your network: On Facebook, I dare you to ask your friends their opinion of __________ and on LinkedIn, pose a question to one of the groups you are a member of. You’ll be amazed at the number and quality of responses. Having something to offer the love of your life is always a good thing, so think about what you can offer your ideal audience in your social networks as well. 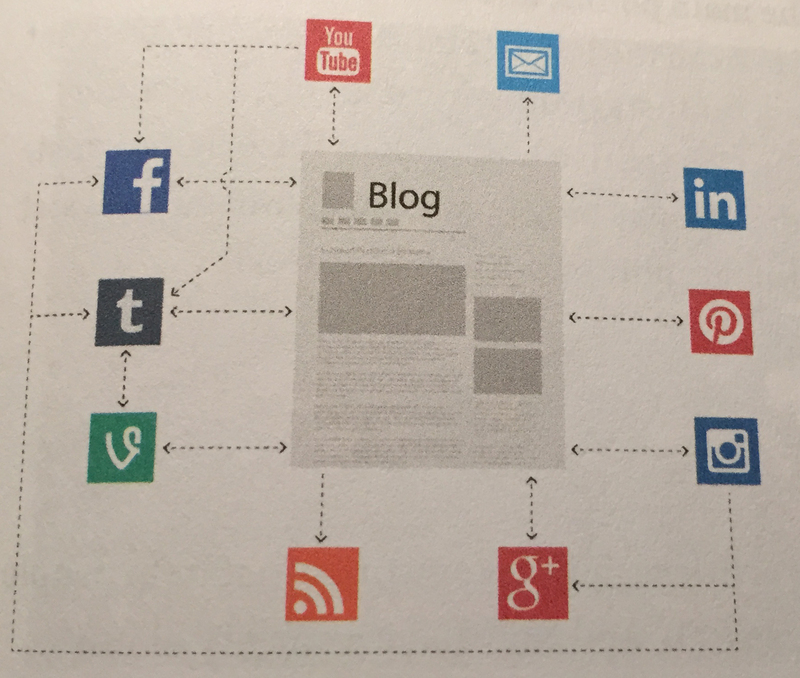 Are you sharing links to valuable content with them? Are you posting humorous videos, inspirational quotes, or even just quippy remarks. Whatever you are offering keeps you top of mind for the people that see your posts and that is always a good thing, because when they are thinking of referring a friend to an expert in your field, hello, you’re it. What would a relationship be without visits? You have to spend time with someone in order to get to know them, silly. So go and visit some blogs about your favorite product, or topic. Post a comment or two and join the conversation. It may not lead to your next million right now, but it will make you feel good and allow you to practice sharing the love. Yes, you’ve reached that point in the relationship when it’s time to pop the question. Is this a relationship with long term potential or mutual benefit? To engage your ideal audience, you need to add value, spark their attention, keep them informed and be top of mind. You want your ideal audience to think of you as an expert, a friend, a confident and someone with whom having a long term relationship will be good, so treat them with respect and show them some love. Contests and giveaways work well for engaging as does plain old GOOD CONTENT! So, my friends, here’s my advice to you: For best results in social media, think L.O.V.E. 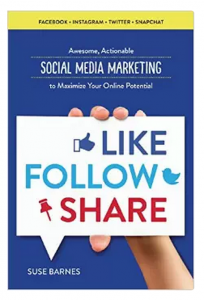 Furthermore when resources are limited in terms of time to spend on various social media channels, 21% of Fortune 100 companies use only one channel and 76% of those companies were likely to use Twitter, with only 14% choosing Facebook and 10 choosing blogging. Twitter means business, where Facebook is entertainment. Twitter is a place to connect around specific topics, where Facebook is a place to connect with friends and family. Twitter is about following people you respect and being followed by people who respect you. Facebook is about having friends, sharing photos, events and having fun. 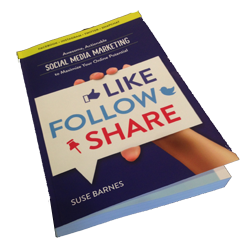 The twitter platform enables sharing of good links more freely and with a bigger reach than Facebook. Repeating on (and retweeting) on Twitter is perfectly acceptable and even encouraged, where repeating on Facebook makes your brand across as annoying. Tweets are more easily digestible than blog posts. Think “byte” sized chunks of valuable information. Twitter combines the fun of Facebook with the information and knowledge value distributed in blogs. Twitter is more mobile and easier to do quickly than Facebook and blogging. Twitter requires more listening than Facebook and blogging and that means the people that embrace the medium are better conversationalists, because dialog means listening and responding. Twitter is real-time, blogging is as soon as I can get to it and Facebook is whenever. Time means money and money means business.